Focaccia is a delicious, flat oven-baked bread that is perfect for yeast aficionados and even more perfect for those who are a leetle scared of yeast and don’t know where to start. A very non-fussy bread dough is whipped together, kneaded for a bit, and then spread into a large baking sheet by none other than your two little hands. Dimpled with little indentations and brushed with olive oil, the dough is baked at a high temperature until golden brown. The hot, tender bread is brushed with a simple mixture of olive oil and salt which gives the outer layer a delicious texture and flavor. 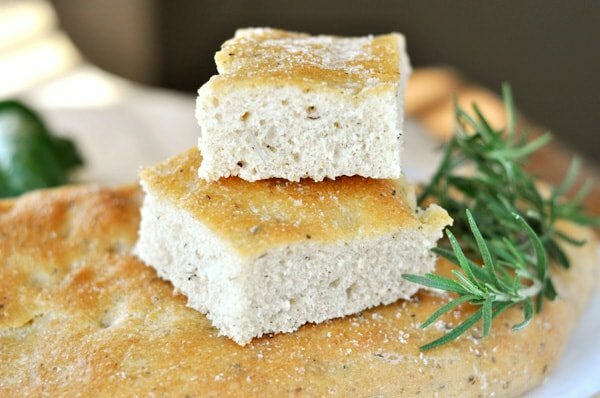 I’ve been looking for a foolproof focaccia recipe and was thrilled when Megan S., a blog reader, sent this one to me. The addition of a myriad of herbs makes this bread pop with flavor and I promise, it is a really, really hard bread to mess up. 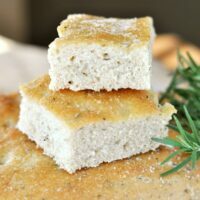 Perfect to serve alongside soups, pastas, grilled meats (the options are endless, really), I heartily want you all to love this herb focaccia bread as much as I do! Thanks, Megan! In a large bowl (or the bowl of a stand mixer), mix the flour, salt, sugar, and yeast. Mix in the garlic and herbs. Pour in the water and olive oil and mix until the dough comes together, by hand or with a dough hook attachment, if using a stand mixer. Knead the dough until it has pulled away from the sides of the bowl (adding additional flour only if necessary – the dough will get less sticky as it kneads), about 4-6 minutes. The dough should be soft and pliable but not overly stiff. Likewise, it shouldn’t leave a lot of sticky dough residue on your fingers. The goal is a soft, supple dough. Cover the bowl with lightly greased plastic wrap and let the dough rise for 30 minutes, until it is puffy. Deflate dough and allow to rest for 5 minutes. Preheat the oven to 425 degrees F. Lightly grease a large, rimmed baking sheet and with your hands, spread the dough out roughly an 8?x10? rectangle. Use your knuckles or fingertips to make indentations over the dough, about every 1/2 inch. Lightly brush dough’s surface with olive oil and bake for 15 to 20 minutes, until golden brown. Immediately after removing from the oven, stir together 1 tablespoon olive oil and 1/2 teaspoon salt and brush over the surface of the hot bread. Tear or slice into pieces and serve. You can use active dry yeast in place of the instant yeast. If you choose to do so, increase the amount of yeast to 1 tablespoon and proof it in 1/4 cup of the water called for in the recipe and the sugar. Let it foam and bubble before adding it to the rest of the ingredients. Also, measure the flour with a light hand (I use the dip-and-sweep method after fluffing the flour up a bit) so that your dough isn’t too stiff and overfloured. You can always add a tablespoon or two extra as the dough mixes if it is too sticky. This paired wonderfully with your Russian Potato and Mushroom Leek Soup! My children loved it too, and I was thrilled to have such tasty bread on the table in an hour’s time. Thank you for the recipe! I hope I don’t ever disappoint them! 🙂 That’s high praise…I’m so glad the soup and bread was well-received! Would fresh herbs work in this recipe instead of dried? I love this bread! Do you think you could grill it directly on the BBQ the way you do pizza? It’s really hot today and I’m wondering how I can have this bread without turning on my oven. All the online recipes for BBQ focaccia involve a baking stone or cast iron pan– I’m wondering if I can just throw it on there. Have you ever tried? I’ve never tried throwing it directly on the grill grates. It stands a chance of working although a pizza stone will probably help it cook more evenly. Thanks to your “Recipes the World Forgot” series, we tried this today. It was so easy and delicious. I wish I would have discovered this years ago! The only change I made (because I was lazy) was to sub Rosemary Garlic Seasoning for the herbs and garlic. My whole family thanks you for all the amazing recipes! Do you think I could bake the dough on my rectangular pizza stone instead of on a baking sheet or would it get too crusty? Hi Elaine – I think that sounds like a great idea. Love, love, love this recipe! Could I make the dough at night and bake in the morning? Would you stop between steps 1 & 2 or 2 & 3? Deb – hmmm, that’s a good idea. If it were me, I’d go through all the steps and actually put it on the baking sheet. Then cover and refrigerate the baking sheet until the next day. Take it out, let it rise and puff (to take the chill off) and dimple the dough. Then bake. Does that help? Good luck! I made this bread last minute tonight and it was so delicious! I’ve never made a “fancy” bread before and this was so easy. Thanks, Mel! Do you think this recipe would freeze well? Before or after baking? Lauren – I’ve frozen the bread (in pieces) after it has been baked and it reheats just fine (usually reheat it on low power in the microwave). Hi Mel! This bread was soooo perfect and so easy to make! How often do you get fresh bread in less than an hour? I hope you don’t mind but I shared this on my new little blog. Such a great recipe. Thank you. Hey Bridgett – Do you put the entire triple batch in a large, rimmed sheet pan (an 11X17)? Mine doesn’t rise against the sides of the pan either – I free form it into a rectangle and it rises in the center of the sheet pan so I don’t think that is the issue. Do you think you might be overflouring the dough? That could certainly make the bread less fluffy and with a firmer texture. My focaccia does not look as “fluffy” as yours. I cooked it on a cookie sheet so it does not cook up against the sides to make it rise up anymore, so could that be the problem? Do I need to use a 9×13 pan? I also have to triple the recipe so that the dough doesn’t get stuck to the center part of my Bosch. It has tasted great the last three times I’ve made it, but the texture looks markedly different than yours! I was just expecting a bit lighter, fluffier bread type bread. Oh yeah, the crust on top and bottom is pretty hard. Thanks for your help troubleshooting! You always help me out! Beth – yes, I double this all the time and I make two separate rectangular loaves of bread. You could probably make one big one but they’ll bake more evenly if you bake two (I bake them on separate pans so that they don’t merge into each other while baking). I served this with leftover lasagne soup the other night and it was a hit. I like that it’s easy to make, with regular ingredients I always have on hand, and can be on the table in an hour. We enjoyed it with olive oil and balsamic vinegar to dip it in. The only problem was that there was not as much leftovers as I was counting on to make paninis the next night. Do you ever make a double batch? If so, do you make two separate “rectangles” or can you make one big one (and does it fit in a jelly-roll pan)? As good as breadsticks in terms of something to accompany soup/stew, but not as fussy to make and shape. Thanks for sharing! I too felt like I had a curse with yeast but after reading your post on yeast and browsing many of your bread recipes, I ordered myself some instant yeast! This recipe was my first attempt and it turned out brilliantly. Thank you! I can’t wait to try out more. It is with great joy (and great satisfaction…and pride…) that I tell you I have officially CONQUERED my fear of yeast (ok…kneading, too)!!! And I owe it to YOU for posting this wonderful recipe! I’ve been “collecting” bread recipes for YEARS (literally). After reading this recipe a bagillion times since your post, I finally decided I was gonna make it or die tryin’. It turned out perfect!!!! (It was amazing, BTW.) Thanks for getting me over the hump. I look forward to trying all those lovely bread recipes just waiting for me! I have made this bread twice already and it is delicious! I am going to make it again for a dinner party, but I want to make it early in the day and then reheat it for dinner. What is the best way to reheat this bread? Thanks for all you do to maintain this awesome site! Hi Katie – if it were me, I’d wrap it in tin foil and reheat in the oven at 200 degrees for 15-20 minutes. Hope that helps! I tried this recipe the other day for the first time. I was so excited by how easy it was and my husband LOVED it! Thank you so much for all the wonderful recipes! My husband is loving it too as I’ve been cooking more for him lately – all because of you! Oh my gosh. I just made this on a whim because we had leftover pot roast and were sick of just eating it plain, so I thought it might make a snazzy sandwich. My husband and I agreed it was the best sandwich we’d had in at least a year. It tasted so gourmet, but it was super easy, I didn’t have to remember to make it in advance so it could rise, and I ALWAYS have these ingredients on hand. Thanks! Everyone loved the bread! Today I made this for my teenagers’ after school snack :o) Thank you for the great recipe! YUMMY YUMMY YUMMY. And looks so easy. I think I will definitely be trying this out. I love making different types of bread. Everything is so much better when you home bake it! Huge hit tonight @ dinner! This was my first attempt at a bread like this & I’m definitely a beginner when it comes to making any kind of bread. This was so easy & I was thrilled when it not only turned out looking great, but it tasted great too. My family loved it. A keeper for sure. This recipe was SO fast, easy and SOO declicious! Made it 2 nights ago for dinner (with the balsamic glazed pork loin…also AWESOME…one of my new favorite pork dishes! ), and then used it for panini sandwiches the next day. We couldn’t get enough, so I’m making another loaf for dinner tonight! P.S. For some reason, I couldn’t find any dried rosemary in my cupboard, so I just used 2 teaspoons of Italian seasoning in place of all of the dried seasonings, and it turned out great! 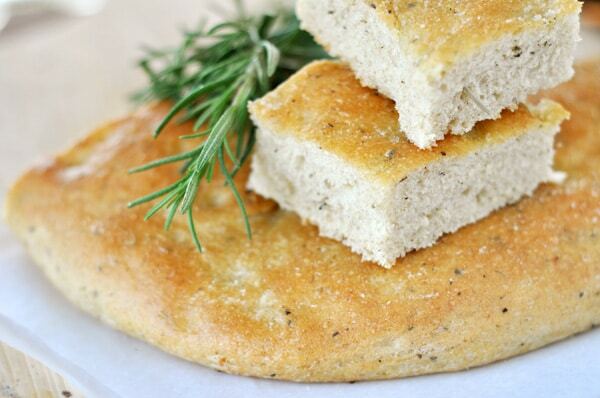 I love that doughy feeling of Focaccia and this looks like a wonderful recipe! Your recipes are really inspiring, thanks! Any chance this would work with whole wheat flour? Allyson – yes, I’ve used half whole wheat (white wheat) with good results. Also, my sister says she tried this with whole wheat (the entire quantity) and it still turned out well. I too LOVE Focaccia bread Mel. I have to admit I was intimidated by it at first but when I made it and realized how easy it is I coulda smacked myself for being such a ninny. It’s something I make all the time now and keep cut up in my freezer ready to thaw fresh at a moments notice. It’s one of the first breads I taught WizKid how to make. Yes he can make it is so easy. Love your photos Mel. Hi! I just came across your blog the other night and wanted you to know how much I love it! I love to cook for my family and you have such a well organized site with amazing recipes and pictures! I appreciate you sharing your talent with everyone! Hi – I recently found your blog and have been printing recipes like mad! next week I am making at least 3 of your dishes! THANK YOU!!! Hey, is this the one that you’ve been making for awhile? This bread looks fantastic! What do you think about doubling the recipe? Katie – I think doubling the recipe would work great! But you’ll definitely want to split it onto two cookie sheets to bake. Several of you are making the most lovely looking breads. One of these days maybe I’ll be able to go there. I love focaccia with all it’s delicious variations – this looks fabulous, I bet it would make a yummy sandwich!